Spookahuna has already proven himself a major player in Hawaii's hip-hop industry -- most recently as producer of Krystilez's debut, "The 'O'." He now makes an impressive statement as a recording artist with this ambitiously titled album. Spooks describes growing up so poor that he lived in a place with a blue tarp for a roof, and indicates in other tracks that he got involved with some problematic associates and activities before he embraced Jesus. It took "the strength of Schwarzenegger and the heart of a giant," but he turned his life around. Taken as whole, however, "HIStory" has a positive message to share. There is, of course, a significant amount of rap braggadocio to be found, but Spooks also offers insights into the power of positive thinking and the mind-set it takes to succeed as an entrepreneur. The album includes sound bites on that subject, and the liner notes also include motivational insights. Spooks' success to date proves their relevance. "HIStory" is also solid and well-executed. 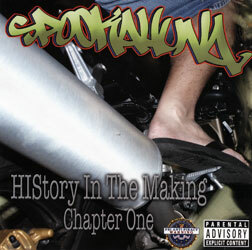 Spooks contributes to the advancement of Hawaii's hip-hop scene with tracks that describe life here, rather than some mythical gangstas' paradise on the mainland. "On Da Sandwich Isles" is an imaginative example of contemporary hapa-haole music, and Spooks' heartfelt requiem for his mother should be taken to heart by everyone whose mother is still alive. 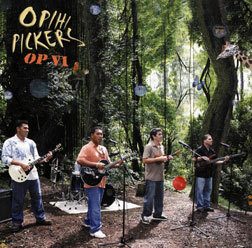 The Opihi Pickers have come a long way from their problematic debut album, "Fresh Off the Rocks," and matured into a polished Jawaiian pop band. "OP VI" should be an instant hit with Jawaiian fans, but there's more going on here than what Sudden Rush dismisses as "the same old skank (rhythm)." There are no generic Jawaiian remakes at all, the originals are of consistent quality and style, and the musicians' talents are nicely displayed. Imua Garza's work on ukulele gives the arrangements a brightness that marks them as being of Hawaii, but the other members of the group (Hoku Garza, Kahale Morales and Kevin Okimoto), and guest drummer Luke Daddario, make significant contributions, as well. Lyrics are often a challenge for young local songwriters, but Imua Garza proves equal to the challenge. He writes eloquently of young love found and lost, and of the challenges involved in keeping a relationship together -- "Let's not build a battleground," he writes in "Put Your Trust in Me." Another noteworthy selection, "I'm Yours," shows the Pickers can do soft pop ballads with finesse as well. "Palomas Volando" showcases the Pickers' instrumental skills with a Latin number that features Imua Garza on ukulele and keyboards but also gives the other guys time in the spotlight. The song is a nice break from the Jawaiian pop theme, but the prominence of the ukulele ensures that it, too, feels like a natural fit. Add the opening song, "Beautiful Ladies (Beautiful Girls)," a catchy and instantly memorable composition by the Garza brothers' cousin, Ramon Garza, and "OP VI" has all it needs to become one of the year's big titles in Jawaiian pop.